Autumn is in air, soon the snowflakes will fly so I have to squeeze in the last outdoor concrete projects now. My ‘concrete-ideas-brain’ is always looking at every container and vessel to imagine of it can be part of a concrete project. 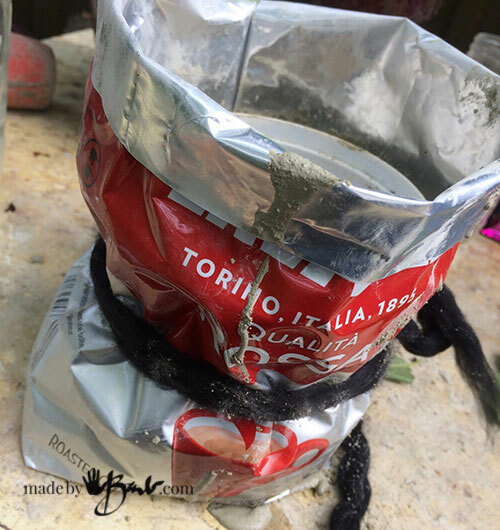 So when putting out the recycling I ‘eagle-eyed’ the foil bags… Yes; another easy, no mold type of way to use concrete! 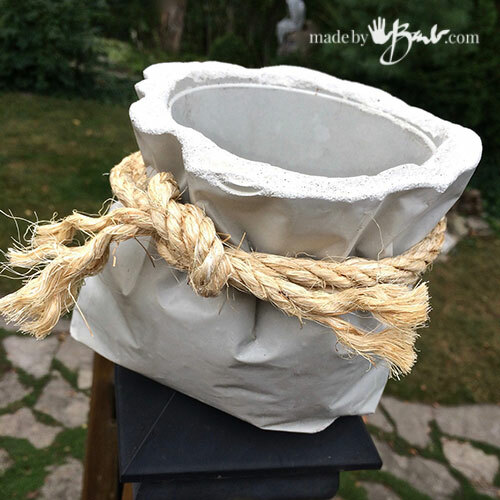 Check your recycle bin and then follow how to make your own Tied Concrete Bag Planter! 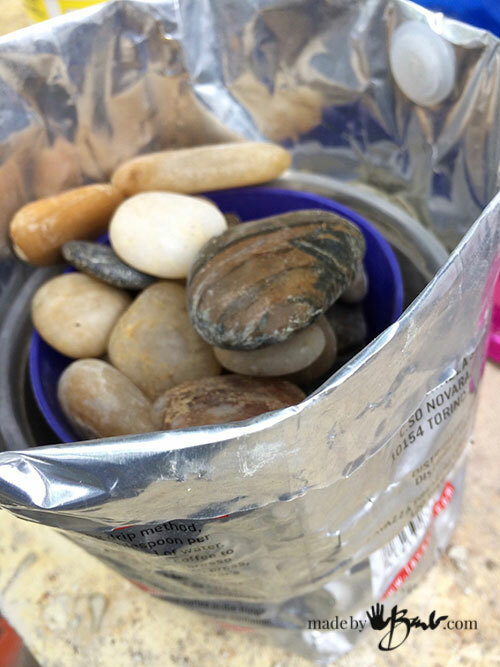 The hardest part of this project is finding the bag and a plastic container that fits inside the bag. 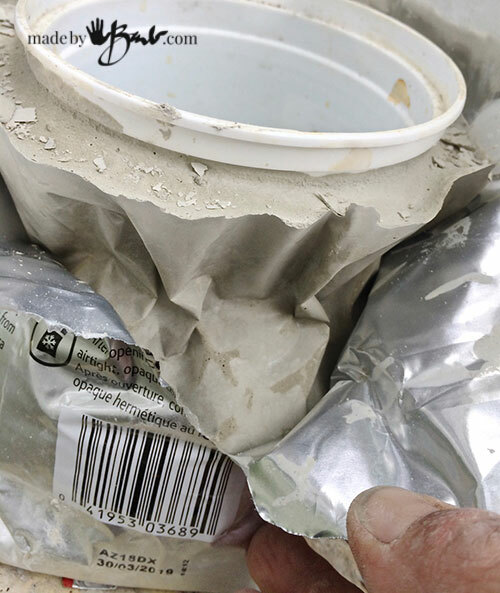 Coffee and dog food bags are made of a heavy foil that holds some of its shape. Potato chip bags could possibly work but they do not have a square bottom shape. 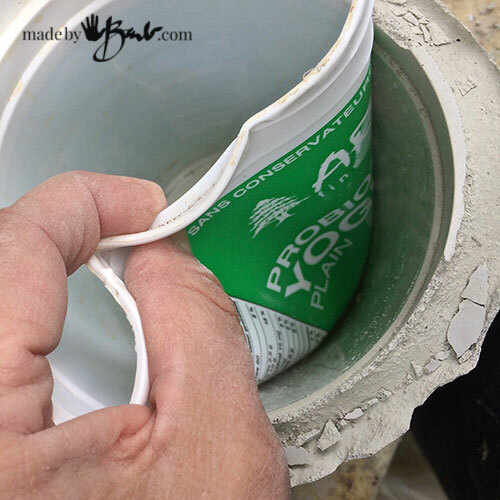 Clean the bag and scout for a plastic vessel that will be the inside void. I used a large yogurt container as it is also very flexible. 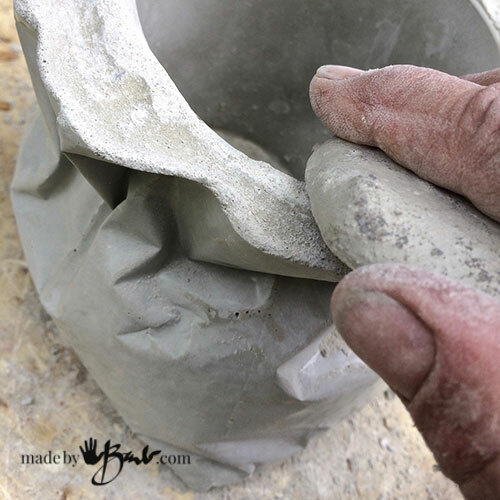 After washing, fold over the top rim and plan how tall it will need to be according with the inside vessel. Ideally the amount of size difference should not be too large or it will need a lot of concrete and become quite heavy. 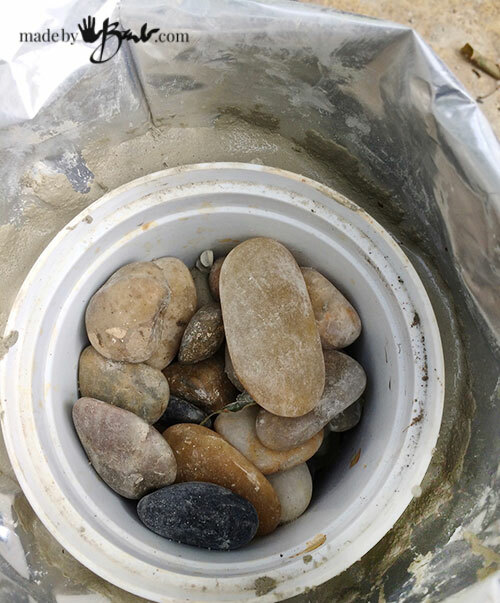 Have something handy that will weigh down the inside vessel like stones or even water. 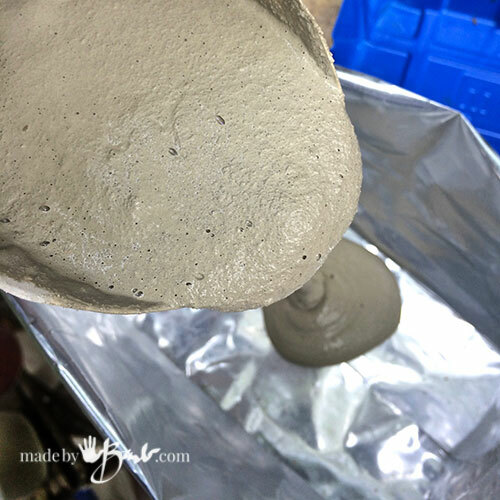 Place the empty bag on a level surface and mix your concrete. 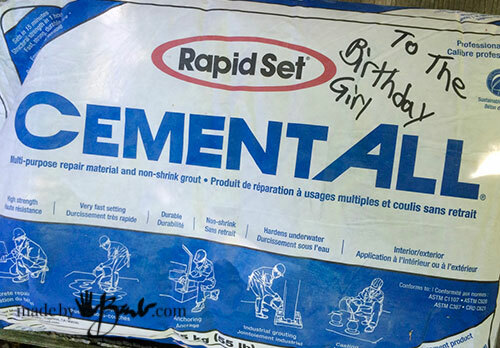 This Rapidset Cementall mix sets quickly but can be used at a consistency that is quite fluid for this project. 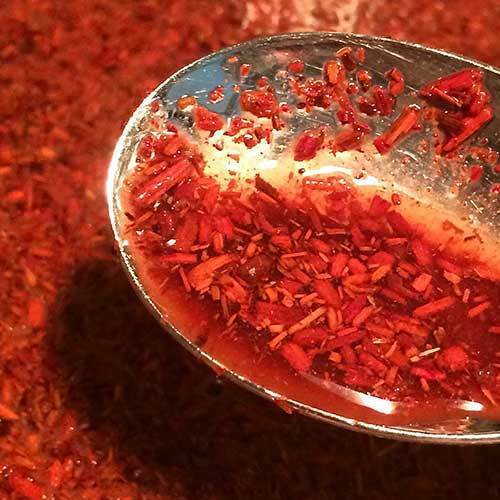 It will be a bit of luck to figure out how much to mix, generally a bit more than you think you need seems like the magic amount. I do not use any release agent as the concrete does not stick to it at all. 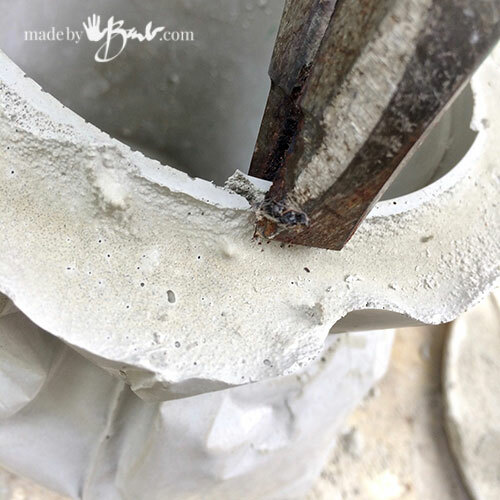 Working quickly, use some rope or yarn to tie at the height relevant with the inside concrete height. Do not tie extremely tight as then there will not be enough concrete to make the wall there. I squeeze the bag into folds and shapes that seem even. Since this stiffens in minutes, you could hold the shape for a couple minutes to assure how you like it. The more you push the sides the higher the concrete sides will end up. Don’t worry as it is pretty forgiving as a shape. I cut it and easily removed it. Looks great once the foil bag is removed. If the inside vessel is being stubborn it can be twisted as it is q flexible plastic. The edges do end up a bit ‘haphazard’ due to the pouring and filling. No problem! Just take some pliers and chip away any parts that protrude too much. It is quite easy as it has not yet completely cured (24 hours). I like the random top edge, as it looks more like a bag. To create the final look, add some nice chunky rope. If you can’t find any just twist up multiple strands into one heavy thick rope. 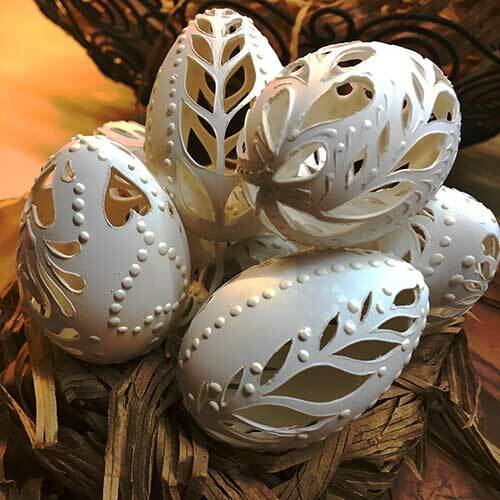 Tie the knot and marvel at your creativity! This one was poured using a dog food bag. 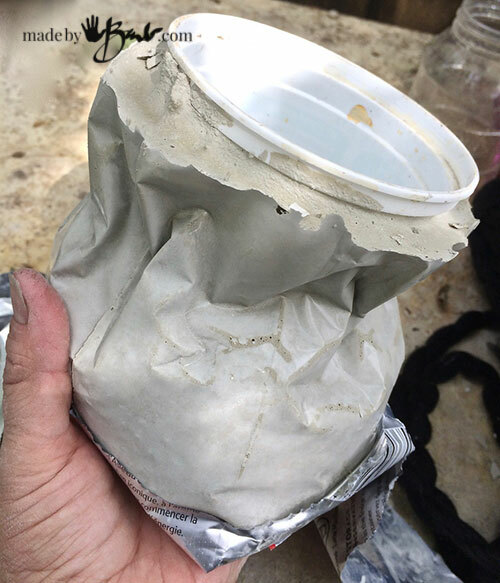 It is a larger bag and the inside vessel was a combination of containers in a plastic bag. (as you can see the wrinkles from the plastic) Each one will be quite unique! 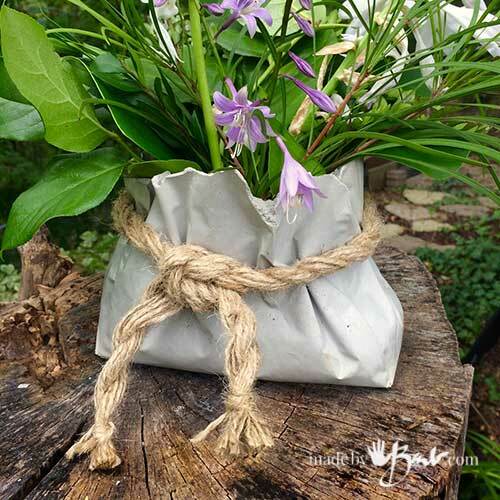 Such a charming outdoor vase! 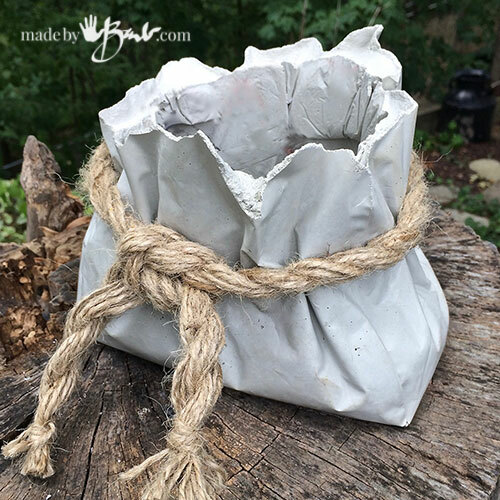 Super easy, unique and quick Tied Concrete Bag Planter! Hurry up and make it before the snow flies! These are beautiful! So simple, but make such a ‘look’, even for cut flowers. OMG! You are a genius! Love It! Thanks, I wish I was! I had always liked the ‘bag’ idea but fabric would be too sticky. You have to think ‘outside the box’, or as in my case ‘inside the recycle box’! Try it! Wow! You did it again. This is a great idea. Thanks! I can dream up new ideas quite easily but getting them all done is more difficult! Once again you come up with a great project, and your instructions are always easy to follow. Thank you! I can’t wait to try this! My want to try list grows ever larger! Could you tell me what succulent you have in the bag? The reddish maroon one. Just love it! These would make great gifts! 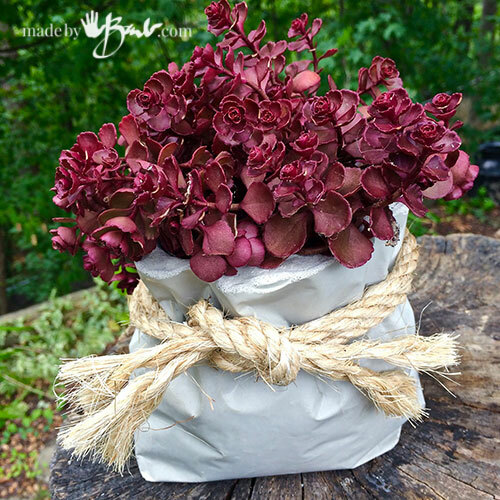 Thank you for this info about the lovely red plant. I never seem to find any hardy succulents for sale around me. I think they only sell the ones that can not take the cold weather hoping that you will buy them again the next spring. By the way, do you drill holes in the bottoms of the planters for drainage for the plants? If so, what bit do you use? Thanks! Once again a wonderful idea. I’ll be trying this next. Here in Hawaii we never worry about freeze, however, finding days that are not too hot are challenging. Can I just say “obsessed”? I look forward to each and every email update. BEAUTIFUL! 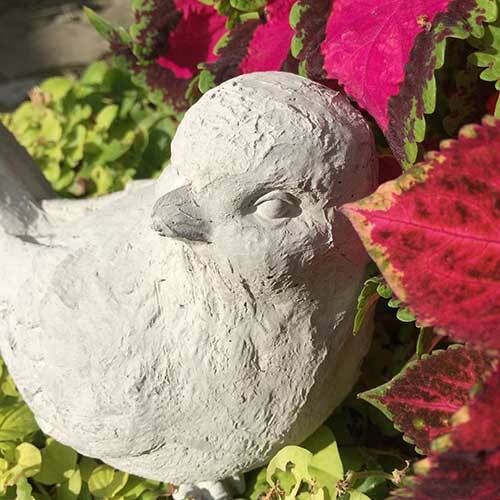 It also adds a more natural look to the garden! Getting on this one soon! Oh yes! It’s the Concrete Step Spook and he will be getting a partner! She is quite the darling! Barbmaker I am extremely impressed by your work and the way you explain things so informative and easy as well .thanks for sharing your experiences.I am a beginner and still have a long way to go. Love these (as I do all your projects!). The last one is my favourite: it is different from the one you demonstrated in that the edges appear very thin, like a real bag would. What technique did you use to get the top edges so thin for that one? What kind of bag did you use to make it and what did you use for the interior? 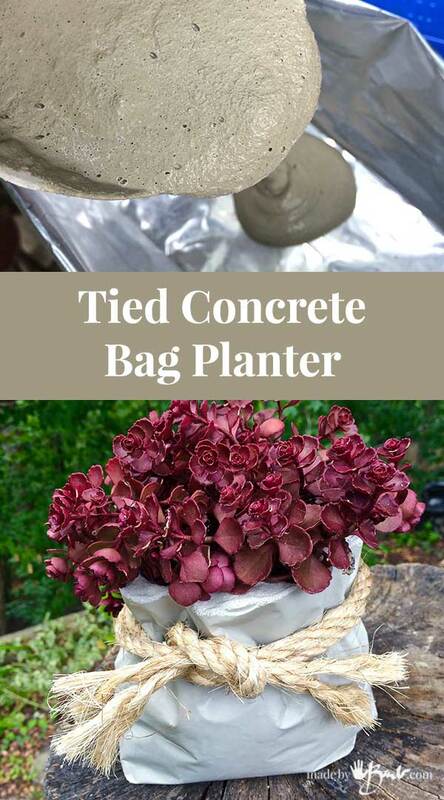 I think I will keep the plastic bowl inside the concrete bag. That is one possibility. We throw out/recycle so many plastics = so many options!